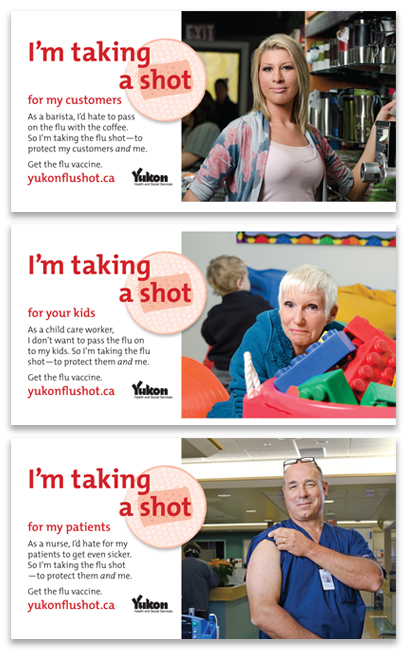 Aasman just launched the flu shot campaign “I’m taking a shot.” It features three Yukoners talking about getting the flu vaccine so they can protect the people they are in contact with. The three scenarios—nurse, child care worker and barista— play out in print, digital and Facebook ads, posters, transit ads and theatre slides. I suppose this constitutes a "campaign," but after reading Doug Brown’s blog post “Are you paying for a campaign and getting an ad?” it looks like one could argue that it isn't. I'd like to suggest our campaign is actually more than the final deliverables—it's the real person in the ad and how they are affected by the experience of contact with those around them. It's the photo shoot, the reactions they get from their boss, coworkers, family, friends, clientele, patients. . . It's the small ripple that starts conversations and builds momentum. I went by Java Connection yesterday to drop off a poster from the "I’m taking a shot” campaign. (One of the JC's baristas, Candace, is featured in the ads.) About five young women came running from behind the counter, the manager Cindy joined us, everyone was excited to see it. The café was full of customers, it seemed like a party. Posted on the beam right next to the cash register, was a cut-out copy of the ad. Lots of positive talk bubbled out about getting the flu shot using the campaign language and Candace has it up on her Facebook profile. So, did I make a case that we actually have a campaign here? Perhaps I should wait and see what happens with our child care worker and nurse. . . wish I had the budget to feature 10, 15, 20 more Yukoners. Hands down this is a campaign Margriet. Anytime you’re using real people, the number of executions builds on the message. I would argue that even if these were models, the message of the campaign - that everybody has a role to play in keeping us all healthy - is enhanced with each additional execution. Sorry to have led you to ponder the question, but to end on a positive note, I think the campaign is fantastic! Well done you guys.